When buying a spa or hot tub, the support and after sales service that is provided is often overlooked. The success of our company is due largely to the individual care we offer our customers. Our hot tub Design Engineer works with each and every customer; no matter how large or small the project, we want to ensure ultimate satisfaction. See what our customers have to say ! 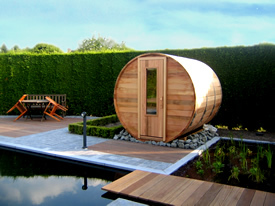 All of our hot tubs and saunas are made solely from top grade Clear Western Red Cedar. Resistance to decay has long been a strong point of this cedarwood. Its aromatic scent is very pleasant and soothing. Its fibrous structure makes it the ideal wood for watertight joints, with one of the highest insulation values among the common types of timber. This is why cedar is the wood of choice for outdoor hot tubs and saunas. what do our customer say ? Check out some special projects and awards ! Find out about the exceptional characteristics of Western Red Cedar!